This delicious hot-smoked salmon recipe can be prepared on the stovetop in a cast-iron skillet. We'll cure the salmon with a simple spice rub of sugar, salt, and pepper. As for what type of wood to use, don't stress too much about it. We use hickory, but you can use oak, apple, ​mesquite, cherry or any other good smoke wood. If you have trouble finding a round cooling rack that will fit inside your skillet, you can use an upside-down aluminum pie pan. Just poke a bunch of holes in it to let the smoke through. Also, make sure your skillet has a lid that fits tightly. In a shallow glass dish, combine the sugar, salt, and pepper. Place the salmon fillets in the dish and rub thoroughly with the spice mixture. Cover with plastic and let stand in the fridge for at least an hour. For maximum flavor, let it cure overnight. Line a large cast iron skillet with foil. Cut a small (1 1/2 inches) hole in the center of the foil to expose the cast iron beneath. You might want to line the lid with foil too, just so that it's easier to clean later. Heat the skillet on high for about five minutes. Meanwhile, you can pat the salmon dry with paper towels (taking care not to rub off the seasonings) and then brush it with olive oil. Place the wood chips in the center of the skillet directly over the hole in the foil. Continue heating until the wood starts to smoke. 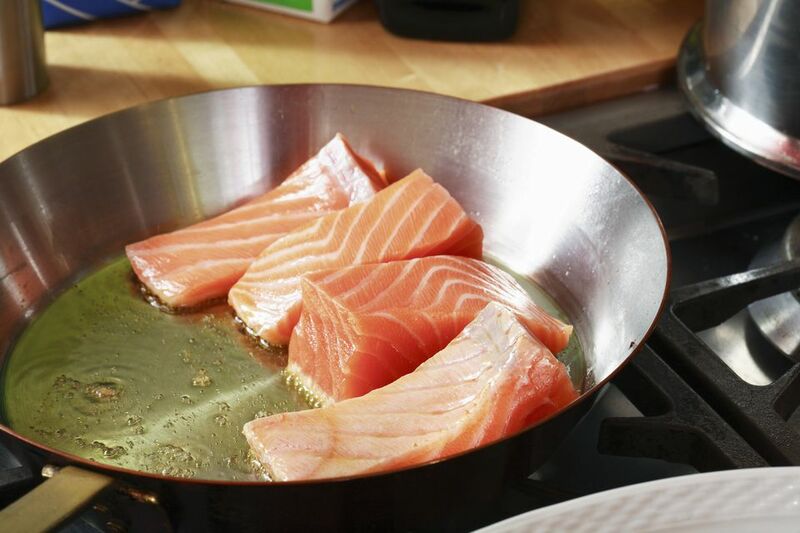 Arrange the salmon on a round wire cooling rack or an inverted aluminum pie pan with holes punched in it. When the wood starts to smoke, set the rack (or pie pan) with the salmon on it into the skillet. Cover tightly and reduce heat to low. Cook for about 9 minutes—more or less depending on the thickness of the fillets.